Want more restaurant recommendations? 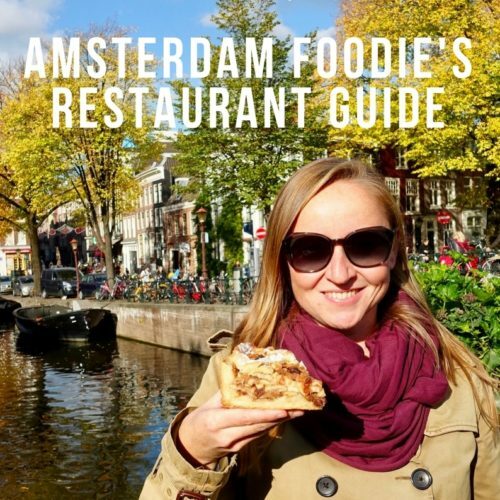 Download my comprehensive Amsterdam restaurant guidebook here. Lion Noir is the kind of place you’d like to go for a high-class hen (bachelorette) party. Its dark decor features impressively masculine antlers, gothic chandeliers, and clientele wearing (wait for it) dresses and heels! Yes, in Amsterdam. It feels ever so slightly debauched without being seedy. And the cocktails are to die for. The last time I ate there it was the night I celebrated my friend’s engagement with the rest of our girlfriends – ideal. One of Morgan & Mees’s huge selling points is its large, covered, heated terrace. Of course, if it’s warm the cover comes off and you can sun yourself in the sheltered courtyard. But even in winter, you can make good use of the outside space. Inside, there are a couple of different rooms plus a separate bar, making it ideal for groups. Lunches include hearty Caesar salads and variations on eggs Benedict, while dinners are a slightly fancier affair of international dishes that are generally shareable. Plus, Morgan & Mees is a hotel too, so if you have international guests in town you could kill two birds with one stone. Opening in 2016, Lt. Cornelis might be located right off the Spui in the heart of tourist-Centrum. And yes, it may have slightly cheesy reproductions of Rembrandts and Vermeers on the walls. 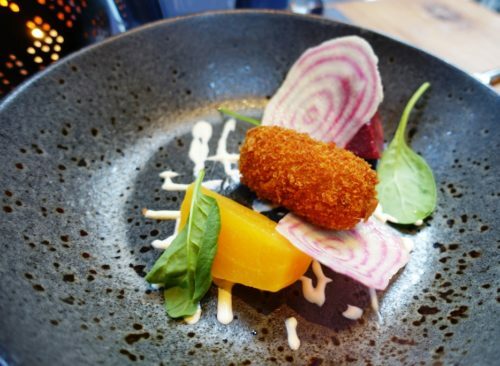 But don’t let that put you off trying some of the best, most authentic Dutch food in town. Standout highlights when I visited included the barley risotto with Jerusalem artichokes, BBQ-ed leeks and messenklever cheese; continuing the smoky theme was BBQ-ed spitskool (cabbage) with crispy-skinned cod and parsnip. The venue is on several levels, and if you go higher up the building you’ll find large private rooms for group dining. Particularly handy for pre-theatre dinner if you have tickets to the Carré, de Ysbreker serves up a broadly French menu very well. Think charcuterie and rillettes to start, with steak tartare or lamb shank to follow, and perhaps a crème brulee or chocolate truffle for dessert. Ysbreker takes groups of up to 160 people (according to their website!) and it’s the right blend of smart and casual that means you could book it for a work dinner or a friend’s birthday party and it would do the job. Set apart from the main restaurant downstairs, upstairs at Jacobsz is a huge space with its own bar that could easily be cordoned off into separate sections if needed. The image below shows a long table laid up for 25, but I could imagine a casual walking dinner for 100 guests there no problem. Plus, catering for a large group needn’t mean compromising on food or service. The evening I went (which, admittedly, was just with two of us – not 20), the food was elegant and creative. Think perfectly rare duck breast and pork belly, with a fusion of seasonal flavours alongside. And the smiliest waitress you’ve ever met. It’s not often that I recommend places to eat in the Red Light District, but Mata Hari is one I end up sending people to time and time again. They serve good beer and G&Ts, so it’s a good spot for an after-work borrel with colleagues. At dinner, they cook up an international menu that leans occasionally in favour of Middle Eastern mezze but also includes pasta, meat and fish. 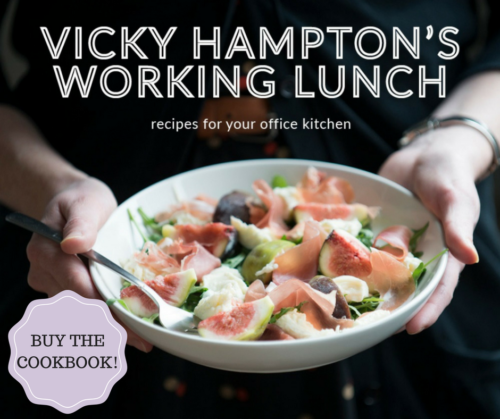 At lunchtime, you can expect bread and salads, but with far more interesting fillings and toppings than the usual ham and cheese variations. The décor is like a giant, split-level living room; I wouldn’t recommend it for a posh client dinner, but for most casual events it’s a great spot in a fun location. 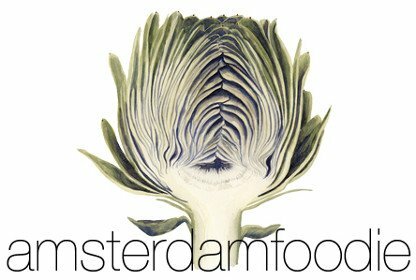 Any restaurant in Amsterdam Noord is generally bigger than most other restaurants in Amsterdam, because most of them have been built in converted shipyards or warehouses. And Stork is no exception: this fish restaurant used to be an industrial warehouse but now feeds up to 150 people – perhaps more in summer when the huge terrace is open. But of course, your group has to like fish! Café-Restaurant Amsterdam (which is particularly hard to Google, for obvious reasons) might not be doing the most creative things with food, but it has something for everyone and does most of it well. Think simple steaks with béarnaise sauce and fries, grilled fish, Caesar salad, vitello tonnato, and good affordable wines by the glass. Plus, the place is huge which gives you a high chance of getting a table for a large group, even if you’ve left it a little last-minute. Despite the name, this restaurant serves a lot more than just burgers. It does, however, have a nice patio for al fresco dining during the summer, and the whole place exudes a sort of Mediterranean vibe… There’s a daily market menu for around €25, or you can choose broadly French and Italian dishes a la carte. For groups of up to 15, you can book via the regular online reservation system. Larger groups are also welcome but menu restrictions do apply. 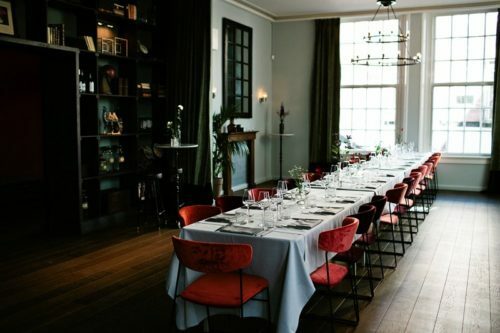 Dauphine is a veritable institution of a restaurant – a favourite among the business lunch crowd who come up from the Amstel business park every day. 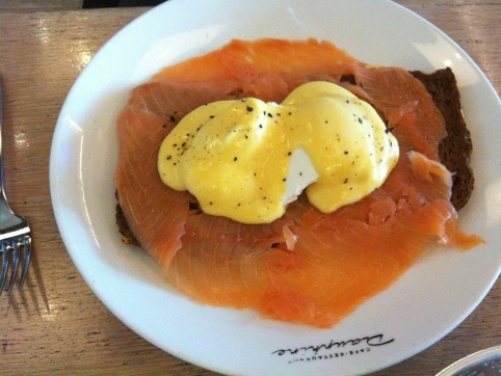 It serves classic Caesar salads, crowd-pleasing steaks, smoked salmon with poached eggs, and desserts from Holtkamp. A great option for a corporate lunch or after-work dinner. The restaurant at Razmataz would fall into the mid-range category, but it also has a lovely separate bar serving eminently shareable (and sizable) snacks at highly reasonable prices. Think creamy bacalao rillettes to spread on bread, charcuterie plates, French cheeses… and they do a lovely Aperol Spritz too. I’ve been here for birthdays, pre-wedding drinks… I even almost hosted my cookbook launch there. With two locations in Amsterdam (at roughly opposite ends of town), Boca’s is perfect for a casual birthday borrel. 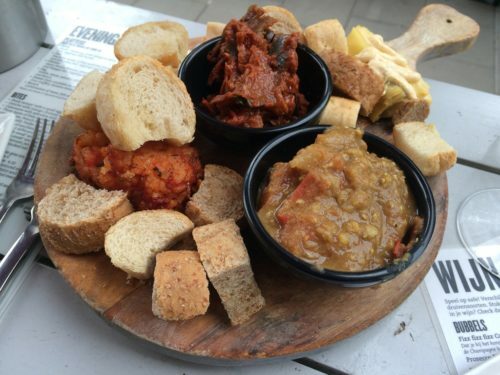 You can order huge platters of meat, fish or vegetarian snacks to share, and the standard is consistently of a much higher quality than your average deep-fried borrelhapjes. I’ve been to Bazar – an enormous converted church on the Albert Cuypstraat – for several group occasions, from hen parties to reunions. The restaurant’s food is a smorgasbord of Middle Eastern and North African dishes, with good-value mezze dishes, kebabs, falafel and more. 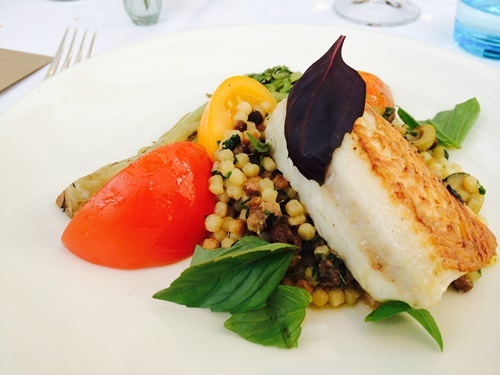 For groups of 13+ people, some menu restrictions apply – take a look at the website. 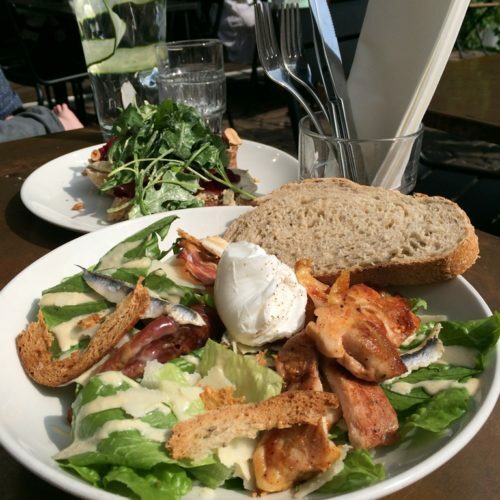 Claiming to have world-famous burgers and 35 sorts of beer, Café Kostverloren is great for a party. I also remember a very accomplished Caesar salad dressing – which is not something to be sniffed at. If your group outing happens to be taking place at the same time as an important Dutch football match, Kostverloren is a good bet to watch the big game (unless of course you’re trying to avoid it altogether). This post was originally published on 20 January 2015 and was updated on 27 February 2017.